The very familiar 3-slot style pay phone was first introduced in the 1950's and remained virtually unchanged until 1965. This appropriately christened prepay-style pay station will take you back to the days of old fashioned phone booths and 10-cent phone calls. 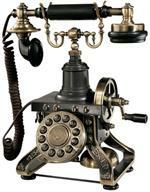 Believe it or not, its predecessor was a post pay-style phone that actually allowed the caller to place their call and then pay once finished. While you don't have to pay for your calls with this pay phone replica, you will enjoy the functional coin slots complete with jingle as your money is deposited into the coin bank in the base of the unit.